Unlocked setup cartridges act as any other REGULAR Cartridges. 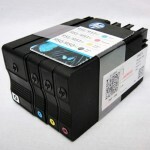 It may be used on any compatible printers and does not need to be new printers. Regular setup cartridges are used for setting up new printers however, these unlocked setup cartridges can be used on ANY compatible printers. Do note that the printers will detect these cartridges as "used" even though they are completely new because we have unlocked them.